It’s a simple chore, this business of observing the growing season’s debut, a chore that requires only looking out the window or strolling along the pathway. Each day brings new life in the form of opening blooms, wafting tree catkins, and emerging wildlife ready for their pollinating, nesting, and procreating work. 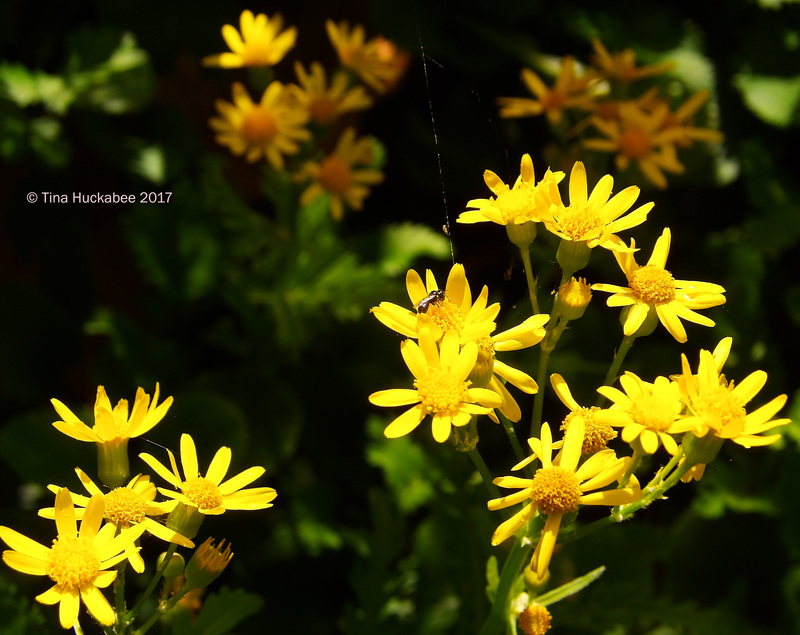 Golden groundsel, Packera obovata, brightens March with full-of-sunshine-beauty. A variety of small pollinators are attracted to these sweet flowers. A tiny Miner(?) bee and her bee buddies are all over the shocking yellow blooms each day, this spring. It looks like there might be a spider nearby–watch out little bees! Crossvine, Bignonia capreolata, flush with terra cotta petals, beckon swiftly flying native metallic bees into alluring yellow throats. The bees were too fast for me to photograph competently, but the blooms held their position. Crossvine is one of Central Texas’ earliest blossoming vines. Thanks to spring breezes, the Crimson flowers of the Old Gay Hill rose are accompanied by the downed catkins of a neighboring Red Oak tree. 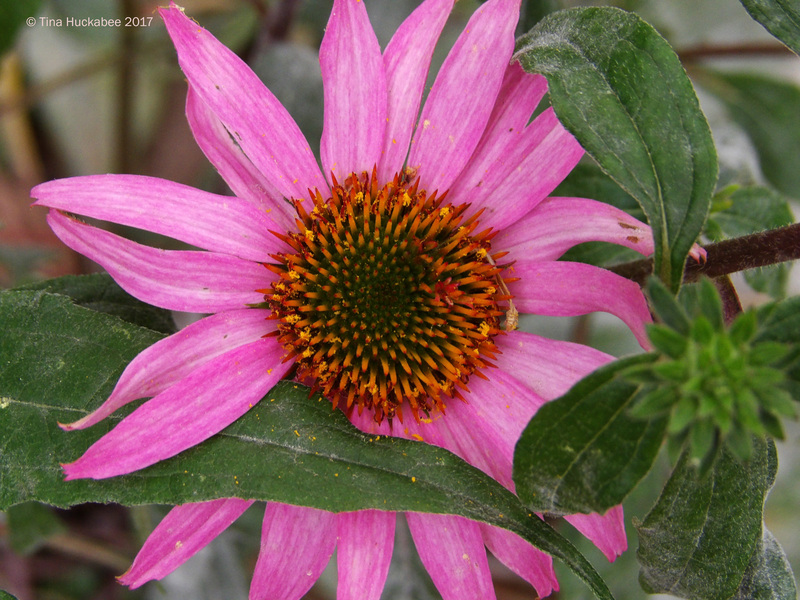 Pink is the true color of the Purple coneflower, Echinacea purpurea, just entering a long, glorious bloom cycle. 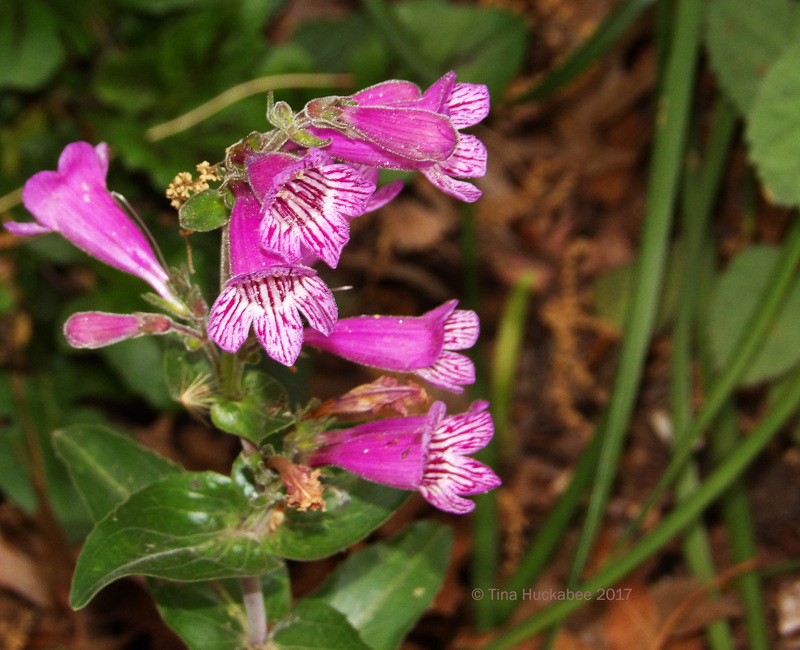 Another spring pink is the native to Central Texas, Hill Country penstemon, Penstemon triflorus. The tubular flowers typically align along tall bloom spikes, though this spring, the whole apparatus of this particular specimen nestles close to the ground. The one currently in bloom waits for action from native bees, its stripes serving as a runway to a luscious nectar and pollen-filled destination. 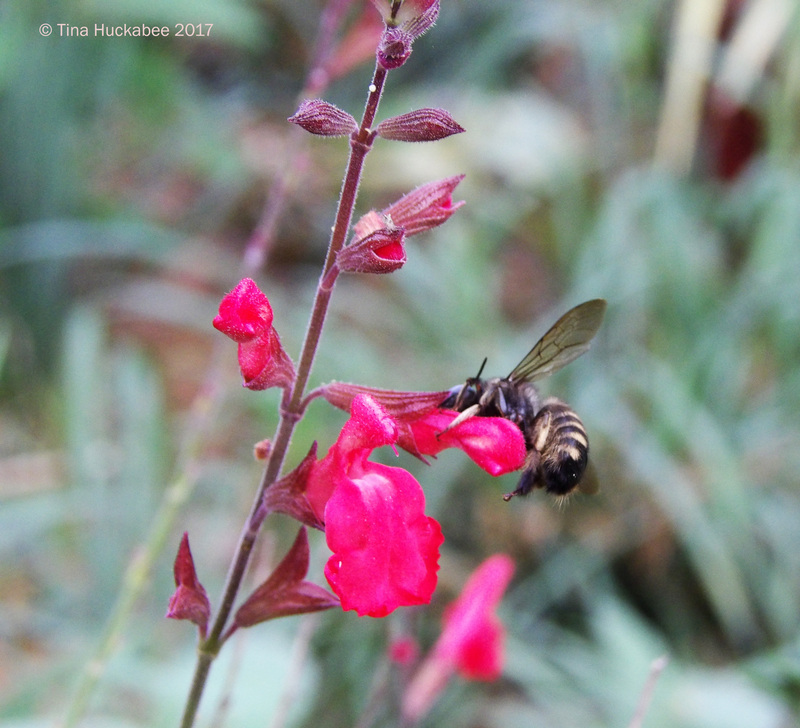 Autumn sage, Salvia greggii, blooms in a variety of colors. This coral beauty is a reliable spring and fall bloomer, taking a break during our toasty summers, though it maintains a tidy, evergreen form in the heat. 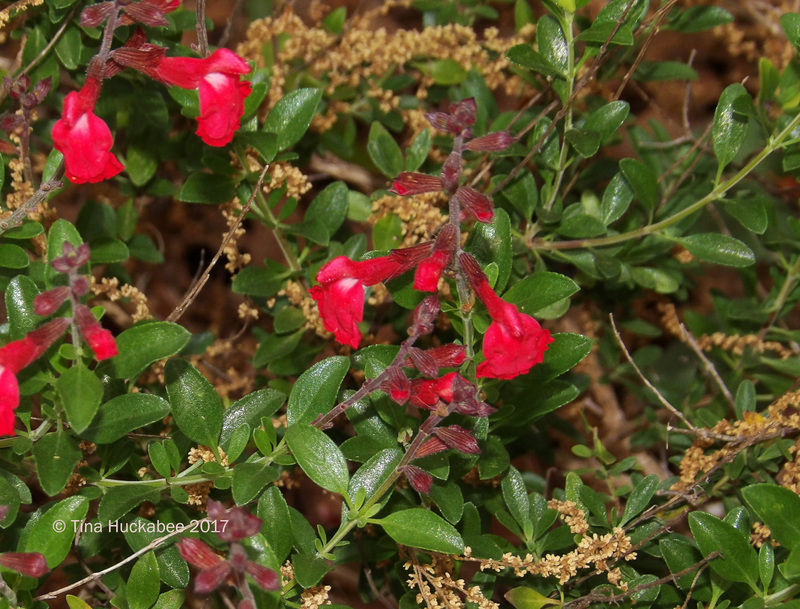 Like so many other plants in my garden, the shrub is currently decorated with Red Oak. The troop of Horsefly-like Carpenter bees, Xylocopa tabaniformis, who reside in my garden have no trouble finding the sweet spot(s) of these lovely blooms. 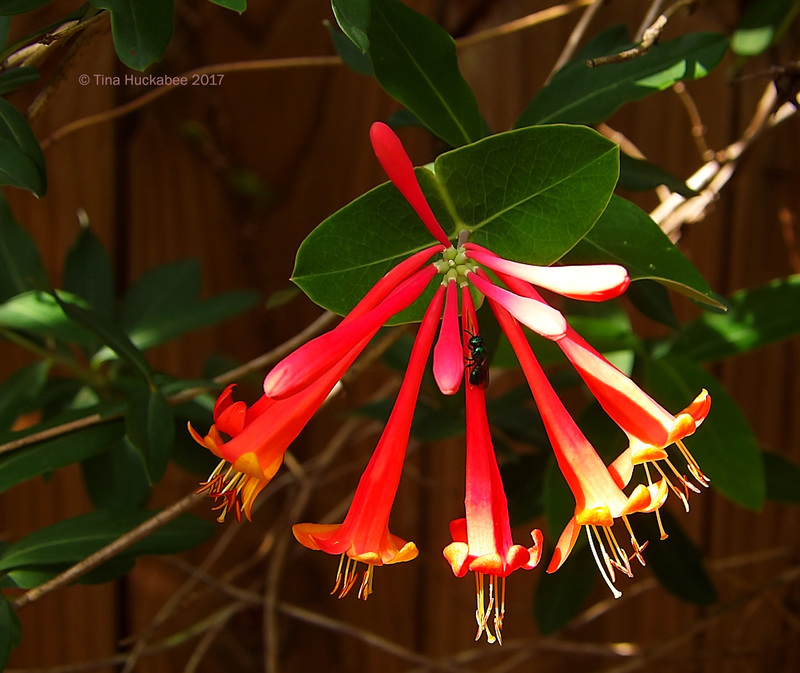 Another blooming vine, the Coral honeysuckle, Lonicera sempervirens, is also a bee magnet. Fortunately, this gorgeous bee (Sweat bee, Augochloropsis metallica ?) rested between forays into the flowers, allowing for its capture in photo form. Blooms are boss and for a look at a spring-flowering festival, check out Carol’s May Dreams Gardens celebrating all things blooming this March. 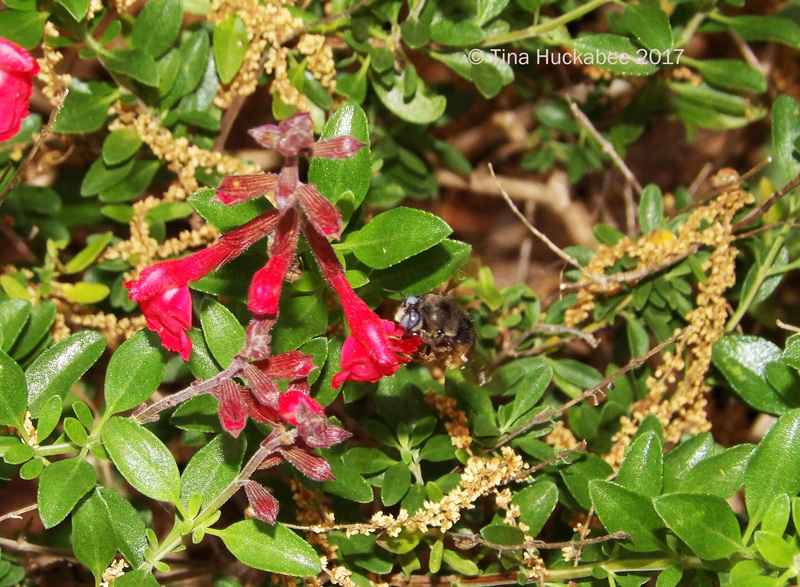 This entry was posted in Autumn Sage, Coral Honeysuckle, Crossvine, Golden Groundsel, Hill Country Penstemon, Old Gay Hill Rose, Purple coneflower, Uncategorized and tagged Garden Bloggers' Bloom Day, GBBD by Tina. Bookmark the permalink. Looking good! I think you are ahead of me, but my plants are starting back. How many times a day do you walk through your garden? Spring is in full swing here, I think. As for visits to the garden, it really depends on my schedule. I walk through the back garden early in the morning, coffee in hand. I check the bees (just a look-see) daily, but I also see what’s new in the garden itself. Sometimes, I can be in the garden several times per day, sometimes, only at the beginning and the end. It’s a daily requirement for me though. I walk through two or three times a day. Morning is always the best time to see what is new. Thanks! Happy blooms to you, as well. Tina what wonderful flowers she has and what lovely pictures. Your garden is divine. 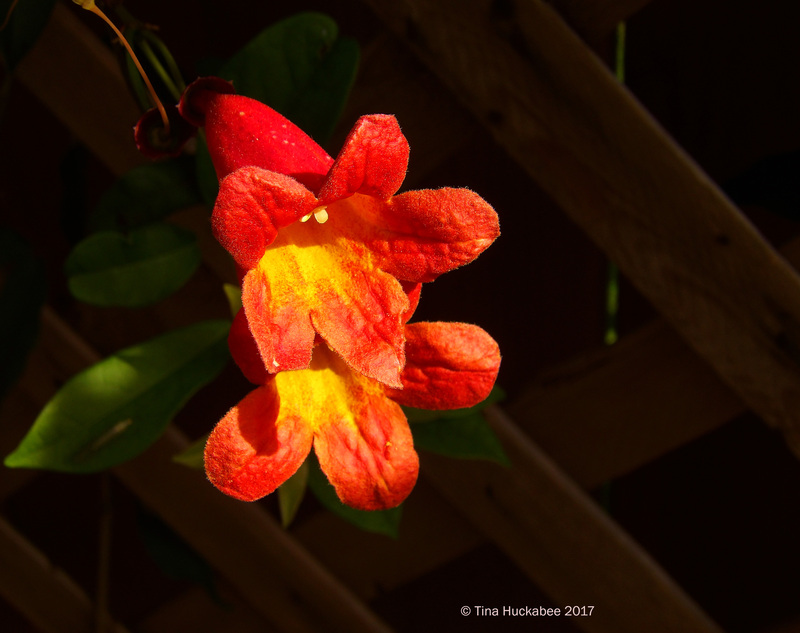 All the flowers I like but the Crossvine is spectacular. I hope your bees are very well. Happy flowers. Greetings from Margarita. Thanks, Margarita–happy flowers to you, too! Lovely photos. I’m s glad that you have bees even if they are not, honey bees. I have, thus, far seen almost no bees. I am very worried. Ohh, I’m concerned that you don’t have bees, too. If you’re in farm country, those agri business folks love to spray… So sorry to hear about that. I live in the largest city that is 100 miles north of you. But people out in the county raise cotton, corn, wheat and oats and of course they spray. Oh, thanks for sharing this! I needed a reminder that spring is on the way! 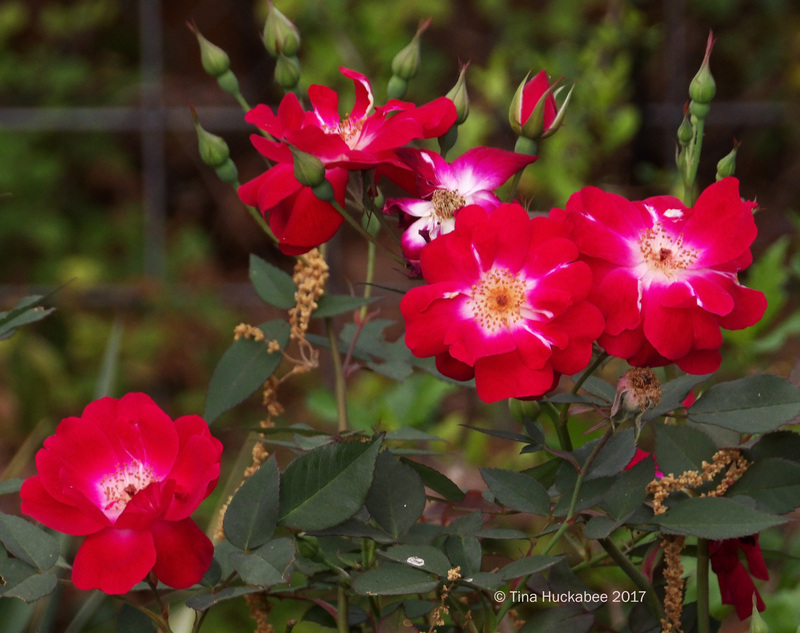 We had a very mild February and all the plants were ready to bloom … until the big chill. Now all my spring plants with buds are covered with snow and it’s been very cold. I hope they will start to bloom next week. Lovely images, Tina! You’re welcome! Things will improve, though probably not soon enough for you. It’s tough when it’s been mild, then the cold reappears. Bummer. Such lovely blooms, but what I love the best is your bees drinking from the bird bath – adorable! Happy GBBD, Tina! Bees like their fluid! Thanks and happy bloom day(s) to you, too, Anna. Beautiful photos. I’m surprised to see echinacea already. Thank you. The coneflowers are just starting up! I was out and about on Sunday, and found large colonies of golden groundsel. Thanks to you, I knew what it was! Honestly, I don’t think I’ve ever seen crossvine or coral honeysuckle. They have to be around. I just need to look a little more closely. Or look up, perhaps! At our NPSOT meeting last Monday, Diana Foss talked about wildscapes, and I certainly thought of you and your garden. Do you know of her? She’s been instrumental in developing gardens in schools, and teaching kids about the interrelationship of plants, pollinators, birds, and animals. It really is fascinating — and amazing what a difference a few yards can make in a neighborhood. Ha! I’m glad you could identify the plant! I love it when that happens. 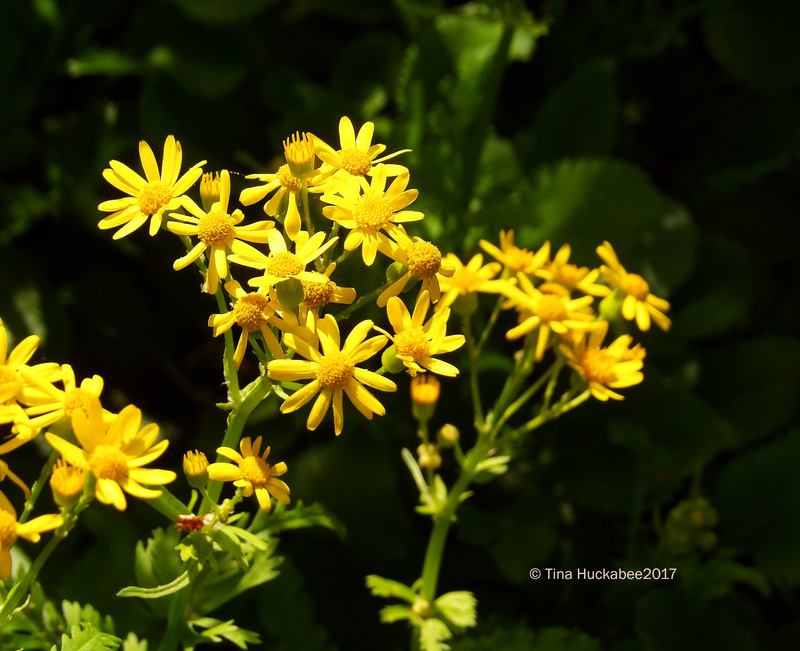 Funnily enough, I was in the Hill Country this past weekend and saw what I thought was Golden groundsel, but on closer inspection, the foliage was different, though the blooms were similar. I need to check out the LBJWC website and find out exactly which related plant it is. I don’t know Diana, but there are lots of great folks promoting the use of native plants and gardening for wildlife. I’ve been interested in native plants for many years and in the past decade, really focusing on garden practices that support our native wildlife. And you’re so right how just a few properly wildscape areas are a boon for endemic wildlife. It looks cheerrfully sunny in your garden Tina, whatever the weather, with those glowing blooms. The coral honeysuckle is wonderful. Thanks, Allison. Spring is in full force, rain or shine!